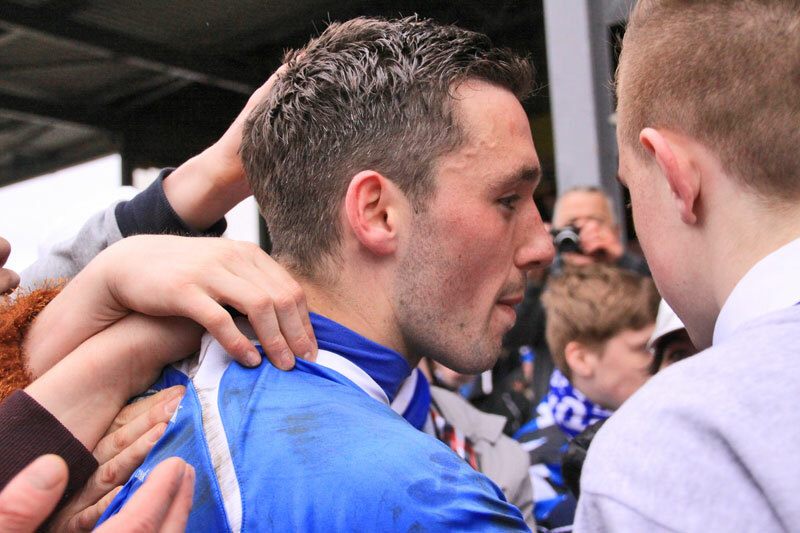 Nicky Clark equalled Jimmy Rutherford`s 81 year-old record of 41 goals in a season as Queen of the South wrapped up the 2012/13 season with a 1-0 victory at Albion Rovers. Cliftonhill saw it`s biggest crowd of the season as hundreds of Doonhamers crammed in to see their heroes extend the highest points total to a record 92 points after the 29th league win of the season. There were plenty of chances in the game as Queens signed off with a good display although it was clear that Nicky Clark`s opportunity to break Rutherford`s record was on everyone`s mind. The striker was foiled on more than one occasion by some excellent goalkeeping from Albion`s Graeme Shepherd but it was on 70 minutes that he finally bagged his goal. Clark had Ryan McGuffie to thank though as the full-back strode forward to find himself one-on-one with the goalkeeper but elected to pass rather than shoot and Clark had the time to take a touch before finding the net. Nicky Clark said: “I was gutted but I can`t really be gutted after scoring 41 goals in a season so I`m delighted. “All the boys were taking their time with corners and stuff but I was telling them to hurry up! It wasn’t to be, a few good saves from the goalie and few last-ditch blocks from their defenders but 41 goals I`ll take that. Manager Allan Johnston was full of praise for his striker: “You could see the boys were desperate to help Nicky beat that record and it`s a great achievement to equal it. “It`s hard to get motivated when you`ve won the league and we beat the points record last week as well but you can see the attitude they’ve got, they kept on going. Their goalie had a couple of good saves and it was just a matter of time before we got the first goal. Once it came I think we were in total control of the game. Following his remarkable scoring form this season Nicky Clark has attracted a fair bit of interest from other managers including Rangers manager Ally McCoist. “I don’t know what’s happening yet, there`s a few things here and there so hopefully I`ll get something done over the next couple of weeks. My next move is probably going to be a big step in my career, whatever I decide to do.